"I found this book brilliant, I had never undertaken anything like a dissertation before and this book had everything in it that I needed to know. It is written in 'simple English' which is a bonus as some books are just too hard to understand. Everything you need to know about writing your dissertation is in here. I would recommend this book to all levels. 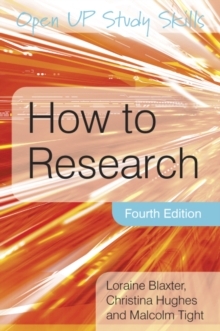 "*****Review of the third edition from Amazon.co.ukHow to Research is a bestselling, practical book that reassures the first time researcher by leading them systematically through the whole research process; from the initial meetings with a supervisor to critically evaluating their ideas, doing the research and finally writing up the project. 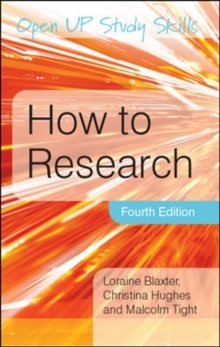 The book includes vignettes to help readers relate to research examples and provides both methodological and process information.New features in this edition include:Additional coverage on literature reviews New material on changes in research ethicsMore detailed information on the use of diaries, internet ethnographies and visual methodsIncreased coverage of mixed methodologiesHow to Research 4e is an ideal resource for the first-time researcher doing a small-scale research project in the social sciences whether they are at university or in the workplace. It supports its readers as they develop their skills to become more experienced researchers.